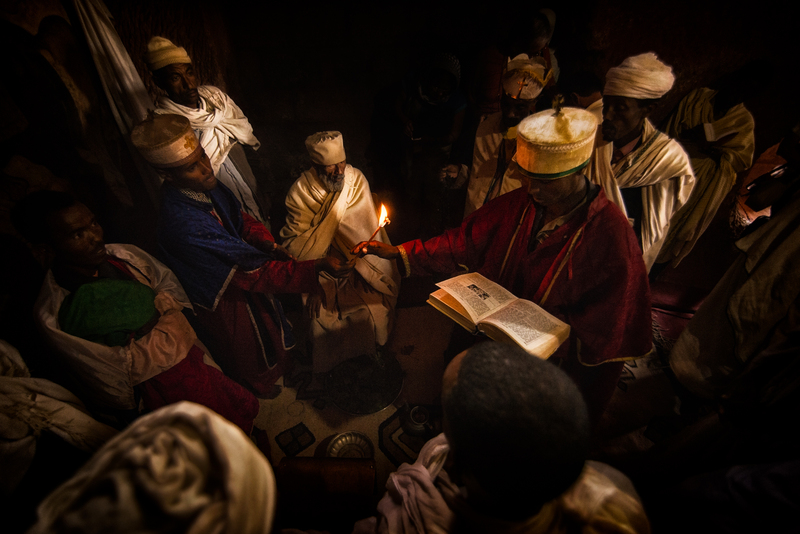 I think there is no place on Earth other than the Northern highlands of Ethiopia where Christianity is so deeply rooted into the soul of the people. 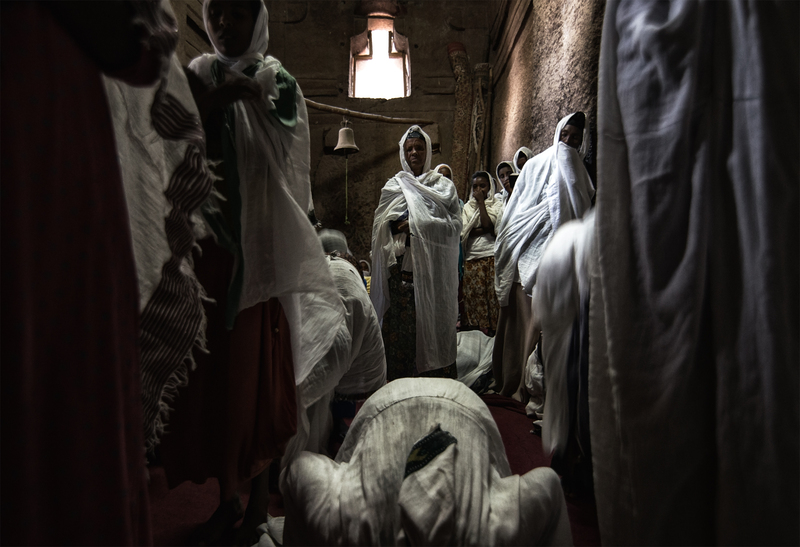 Eager to witness the rich cultural heritage and the mythological ties between Jerusalem and Ethiopian religious beliefs, I had been planning a trip to Ethiopia for a few years. And I have not been disappointed; but I have also found a land full of contradictions. 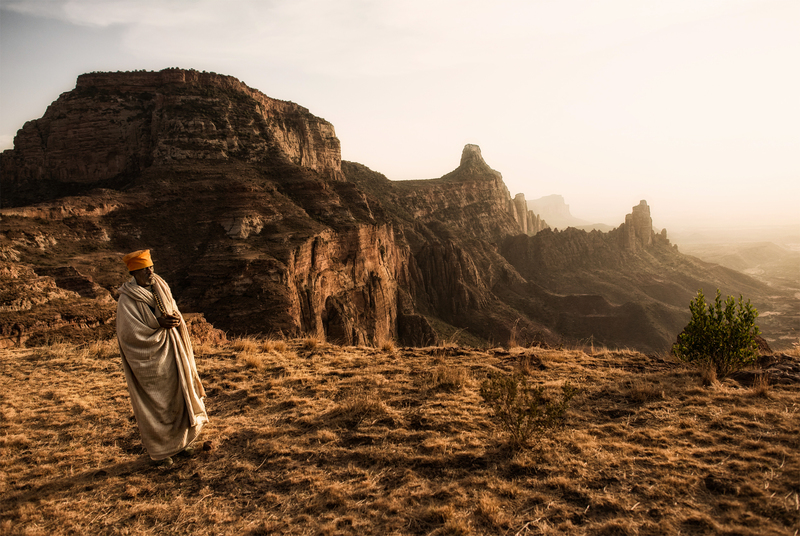 My journey began in the Tembien mountains, a remote region in the Eastern part of Tigray that host some remarkable rock-hewn churches. 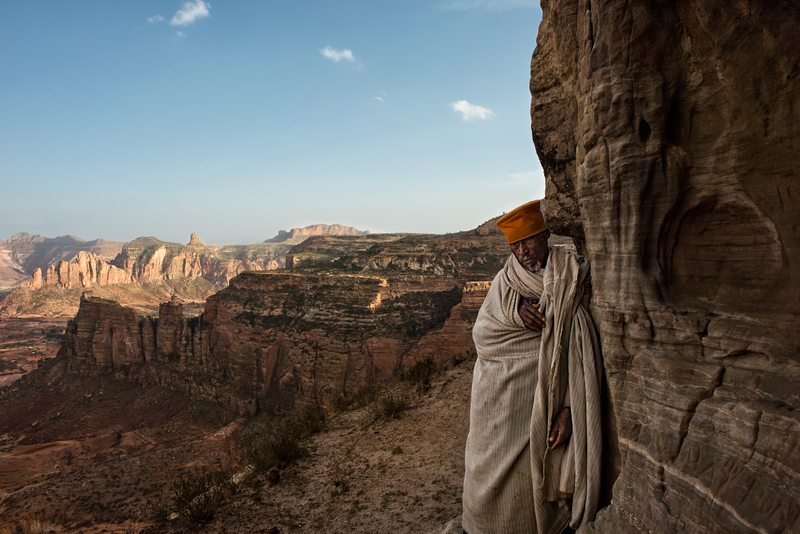 Despite a soon to be finished surfaced road that will connect the Tembien to both Axum and Hawzien, the place is hard to access without a private vehicle and local communities are still slightly amused by the sight of a foreigner. In the rural countryside of Tembien, most people live in traditional stone-house farms, consisting of an animal compound and one or more single-storey buildings covered by a straw roof. 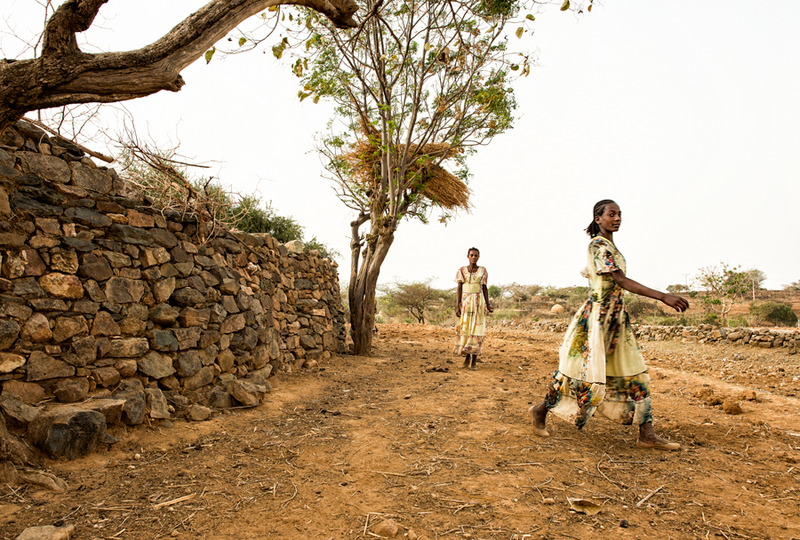 On the way to some rock-hewn churches between Adwa and Abi Aday, we stopped for directions in one of these villages and ended up spending almost an hour to chat with the family of a friendly shepherd. Entrance to the churches can be hit and miss, as it often depends on your luck in finding the priest with the key and his willingness to let you in. While this was straightforward in Gebriel Wukien, a monastic complex where we were invited by the slightly euphoric monks to drink some tella, a locally home-brewed beer, in Maryam Hibeti we had our faith questioned before finally gaining access to the church itself. Maryam Hibeti looks more like an hermit place than a church, partially hidden on the side of a gorge and only accessible after an exhausting hike. The gloomy, cathedral-like interior is cut free from the rock behind and consist of a cloister, a main chamber and a holy spring. When the deacon started to murmur some passages from the bible beside the priest on his side, we moved outside to take shelter in the shadow before setting out for the way back. There we noticed two old women sitting by the church’s door. They explained they came from the village beyond the gorge and were here to help the partially blind priest with his daily routine. 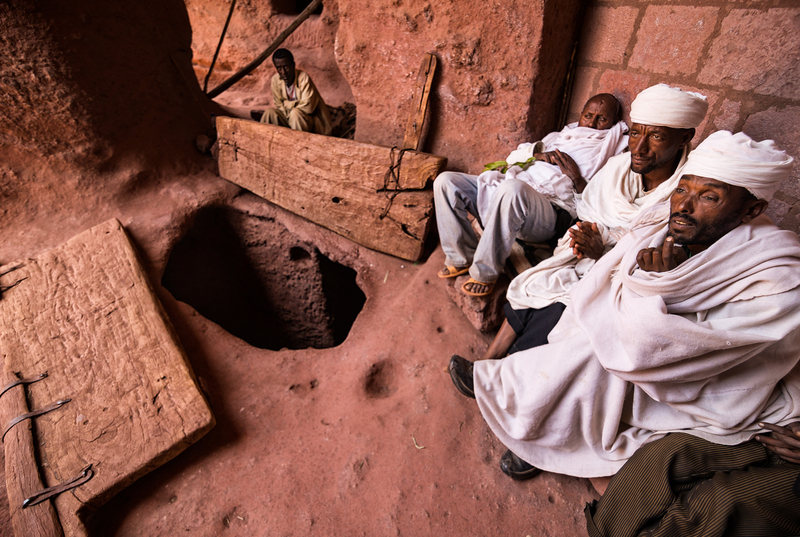 Later in the afternoon we arrived at Abuna Yohanni, a monastery carved into the side of a sandstone cliff and accessible through a system of steps and nooks. The chatty monks living around were among the friendliest folks we met during our trip and they didn’t mind to have some pictures taken in the labyrinth of tunnels or while reading a prayers book.What we didn’t enjoy was the attitude of the youngsters living at the base of the cliff, spoiled by the large tips handed over by unaware tourist groups (as our guide explained on the way back). This didn’t ruin our visit and it was nothing compared to the most visited places, nevertheless we were startled at how quickly the effects of “mass” tourism are reaching this remote part of Tigray. 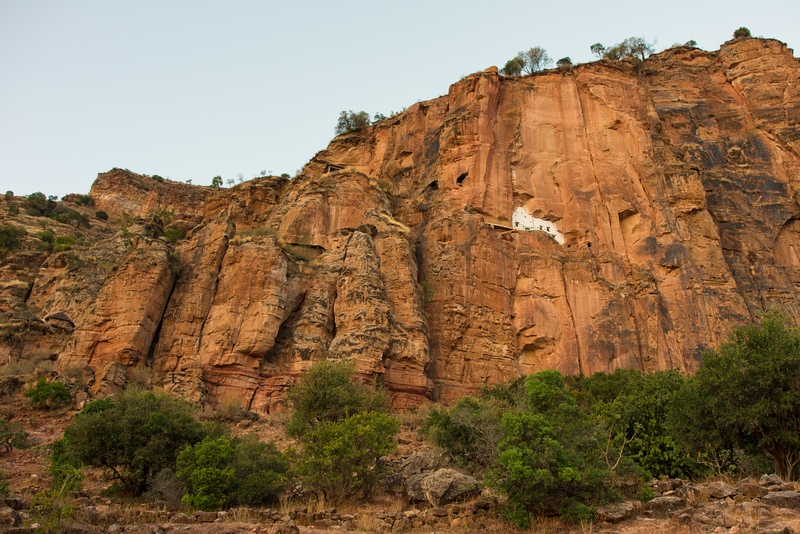 On the other hand, monks are trying to do some good with the tourist bucks and the money collected thanks to the standard 150 Birr entrance fee was recently used to bring electricity, paint the facade in questionable colors and build a new railing on the cliff face. 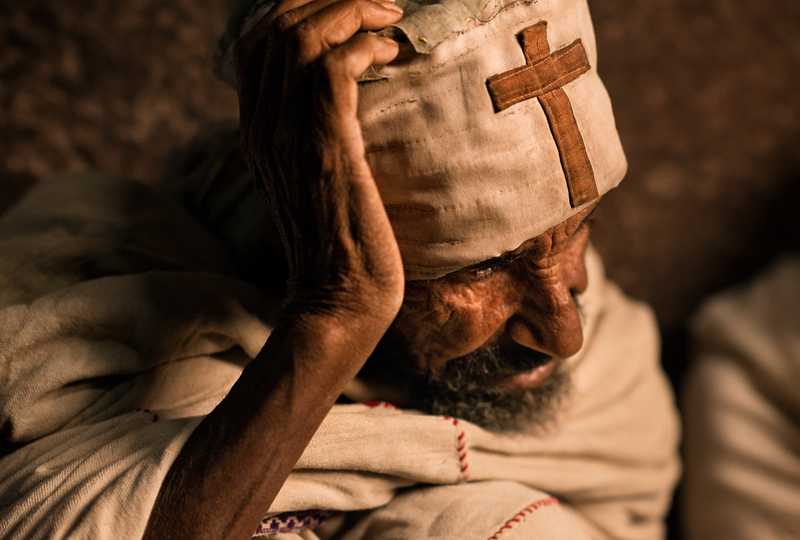 While as a result of the renovation works one of the most photogenic facades in Ethiopia is arguably less atmospheric than it was before, the church is now more easily approached by the elderly and people with a bad head for the heights. What should be remembered is that rock-hewn churches are primarily active sites of worship and not tourist attractions; this is what sets them apart from other man made wonders. 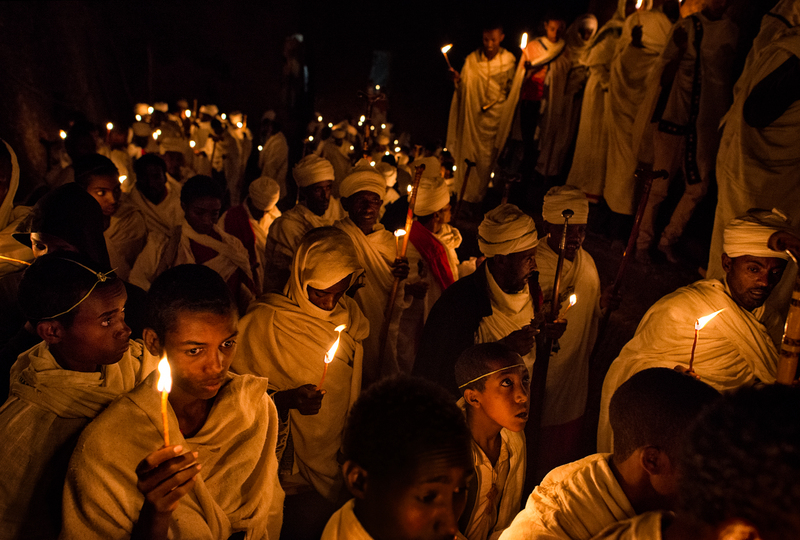 A couple of days later we arrived in Lalibela for the forthcoming Easter celebrations. We were introduced to Destawu, a local guide recommended by a friend in Addis that would have been a valuable and knowledgeable friend for the coming days. 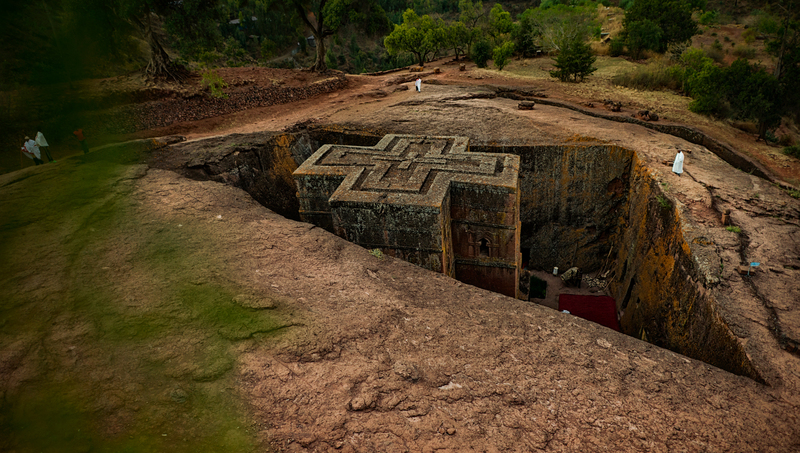 Lalibela consist of monolithic and semi-monolithic churches holding strong symbolic connections with Jerusalem. The complex is divided into a northwest cluster, representing earthly Jerusalem, and a southeast cluster, representing heavenly Jerusalem, separated by the Jordan river. Bet Giyorgis, a stand alone, cross-shaped church, lies apart from the others and symbolize the Ark of Noah. Churches are like a labyrinth to me, an 800 years old labyrinth that leave you speechless the more you wander through the system of tunnels and trenches connecting one chamber to the other. The secret pathways, the smell of candles, the light passing through the cross shaped windows and the withe robed priest give a sort of aura, a solemn feeling to these buildings. 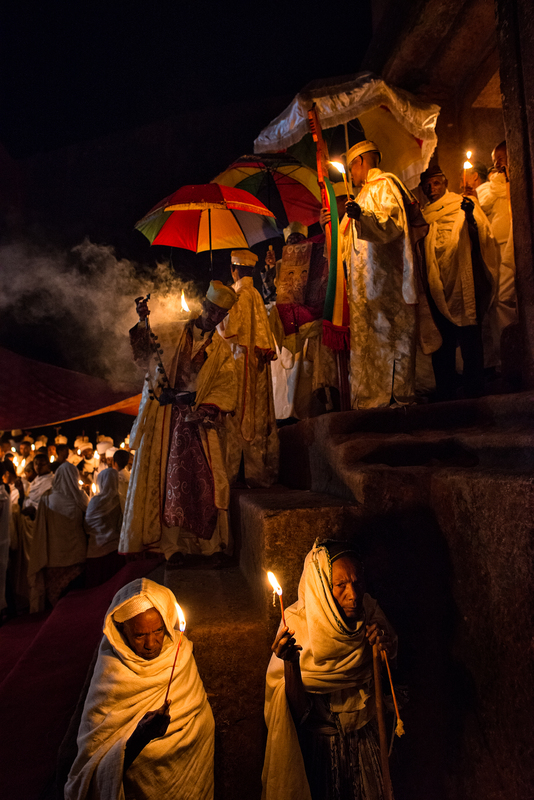 The Holy week is probably the busiest and most colorful period to visit Lalibela, although most of the the celebrations are concentrated on the the three days preceding Easter. 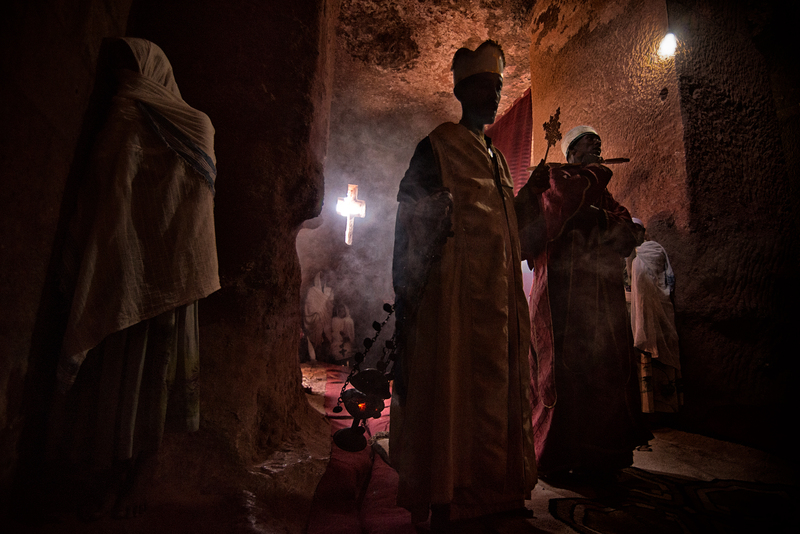 After a few days spent to wander among the different clusters, on Holy Thursday a long dark tunnel took us to the little Bet Merkorios, where a few priest were sitting waiting for the afternoon mass. Psalms and prayers were being recited that day and we were lucky enough to assist to a solemn mass that reached its climax with the ritual washing of feet. The Holy Friday is a day of sorrow. Early in the morning a short walk took us to Bet Maryam, right in time to witness the sight of thousands of pilgrims gather in and around the churches to mourn the death of Jesus. Seeing these people praying all day, fasting under the hot sun and sleeping within cracks in the ground, makes you realize their faith is not something to be taken lightly. The faithful prostrate themselves at the sound of a little bell from dawn till 3 p.m., when a representation of Christ’s body is carried into the church after a short procession. 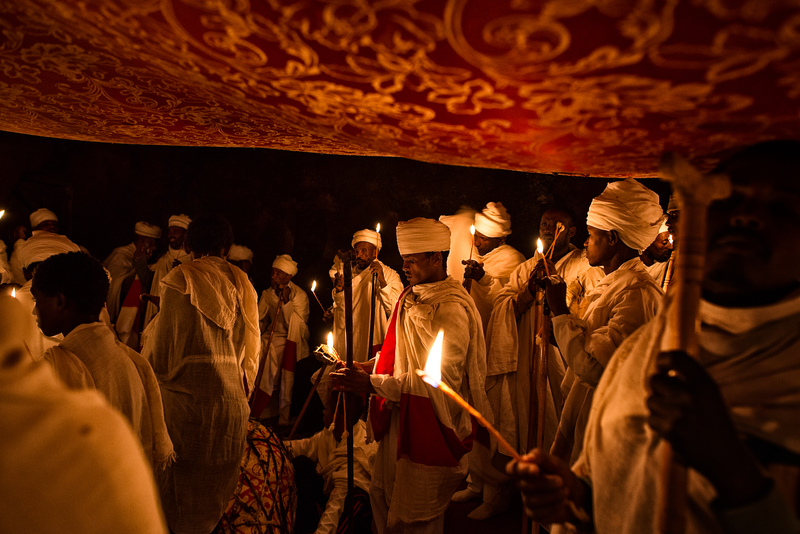 In the yard surrounding Bet Maryam we could assist to a ritual unique to the Ethiopian Orthodox tradition. Several deacons formed a circle surrounding a man in the middle holding a stick with a candle at its tip. At the end of the prayer all men stroke the stick and extinguished the fire, a symbolic ritual to chase the devils and curse Judas and his generation. This marked the end of the day and the beginning of a night of watchful expectation. On Holy Saturday there wasn’t much going on during the day, with villagers flooding the local market in anticipation of Easter. Churches came back to life at night for the most important of the celebrations: the resurrection of Christ. We decided to spend the night in the yard surrounding Bet Giyorgis, supposedly more quite and peaceful than the crowded Bet Maryam and Bet Medhane Alem. We entered through a door at the end of the trench and were enveloped by a thick darkness, pierced only by the candles of the priests murmuring passages from the Bible. We waited, until suddenly, at midnight, candles were blown out and the church plunged into a pitch black. In a fever of excitement, pressed by the crowd that was now filling every corner, a light emerged from the sanctuary breaking the surreal silence. “Christ has risen”, was heard everywhere, hundreds of people now lighting their candles with the solitary flame that came out of the blackness. People began walking along the sides of the church and the flames leaped from candle to candle, lighting the most remote corners of the sanctuary. In the sense of hospitality and communion that was permeating the place a priest lent me his stick to take some rest amid the standing crowd. I accepted gratefully and stood for a few minutes while watching the light of candles slowly fading away. That was a great, moving ceremony, one of the moments I want to remember when I’ll think of Africa. The next morning only a few worshippers were left praying around the churches. Easter marks the end of fasting and Destawu invited us for lunch in his place; we had a great meal with him and his family and possibly the best coffee ever! With the town rapidly going back to its routine, we had time to rationalize what had happened during the last few days. 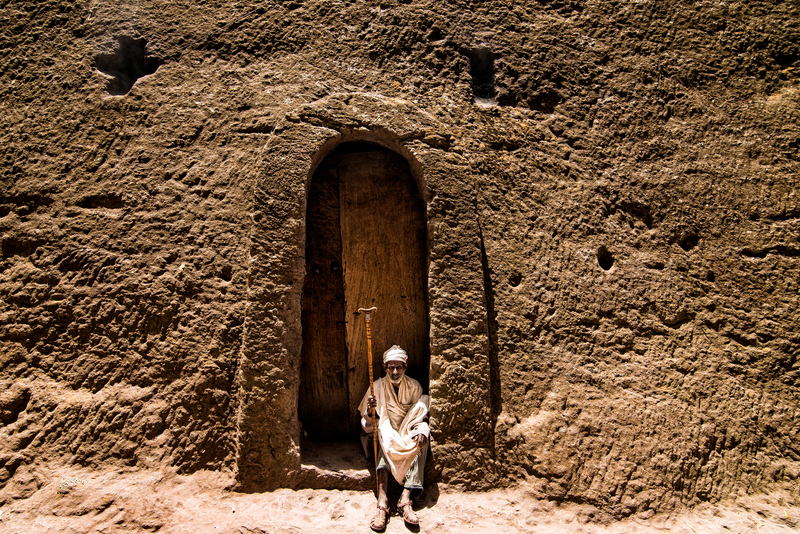 If is unquestionable that Lalibela is a spiritual place, possibly the holiest place in Ethiopia for Orthodox Christians, there’s much going unseen to the casual traveler. 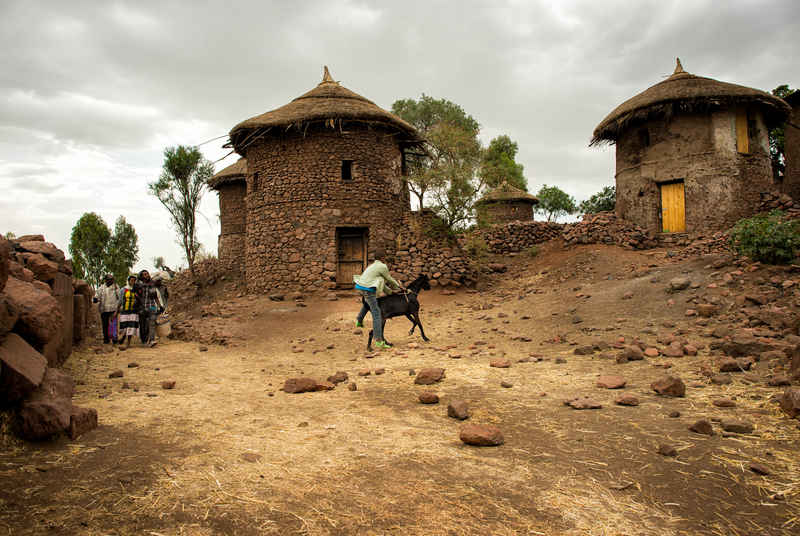 Talking to some “educated” people in town, we learned that Lalibela has recently undergone a resettlement project that forcedly relocated villagers from the hills around the religious complex, with little compensation. According to official documents, the scope of the project financed by the world bank, was to “enhance the upkeep of the historic and cultural sites and the promotion of these sites as tourist attractions”. Personally, I think that the identity of a place is given by the nature of the people living around and seeing empty tukuls dotting the area around the “core zone” gave me a weird feeling. If sustainability means turning an active holy place in a tourist playground, which I am afraid might happen in the recent future, the development of the town should probably be reconsidered. The relocation also gave some extra power to the clergy, which is in charge to manage (part of) the tourist money flooding into the monolithic complex. 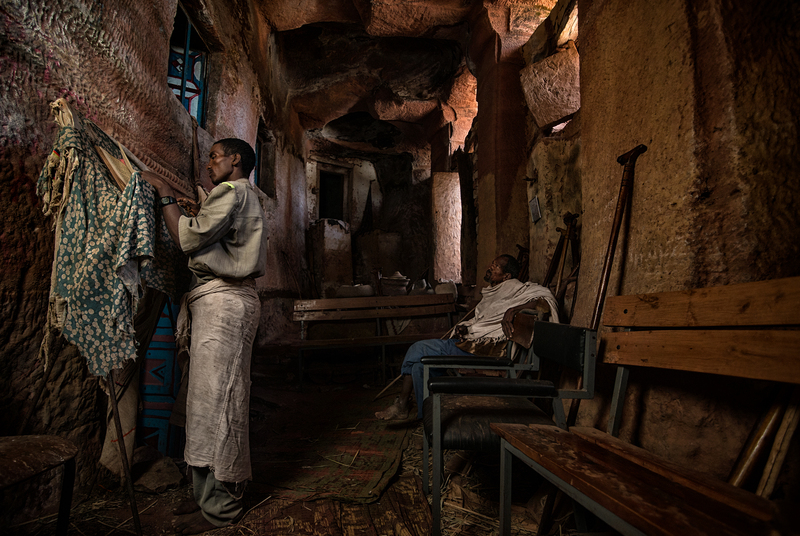 While this money was supposed to be used for some public utility projects, the 800+ priests living in Lalibela have apparently different ideas and are in the process of building their third hotel in town. Again, I could touch with my hands the faith of both priests and worshippers, but coming from a country where the business side of the clergy is so plain obvious, I found all of this disturbing to say the least. 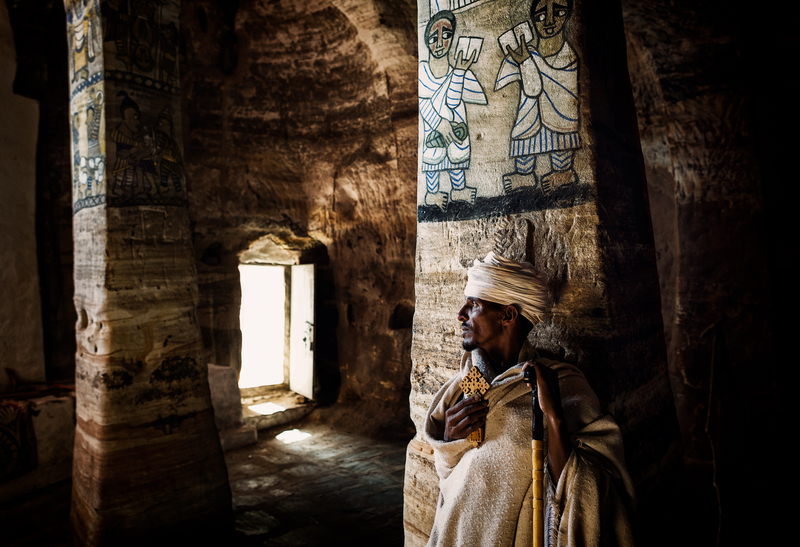 With the end of the Easter celebrations, a very long drive took us to Mekele and then forward to the Gheralta region, home of the most stunning and inaccessible rock-hewn churches of Tigray. It’s anybody’s guess why these churches were built in hard to get cliffs; was it for protection from the Jews or the Muslims? Were they hermitages, spiritual places where to pray a step closer to God, the wind as your only comrade? People gave us different versions, but what’s certain, these churches maintain an aura and a spiritual integrity that you won’t find anywhere else in the Christian world. 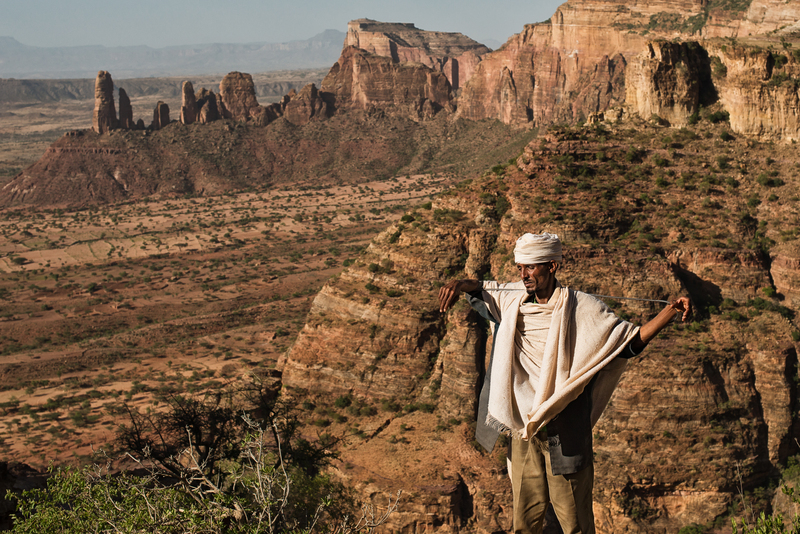 After a stop at the architectural masterpiece called Abreha we Atsbeha, in the early afternoon we reached the base of the Kororo massif, a red stained vertical wall standing fierce near the village of Megab. Our guide took us through a scar-looking path in the mountain, the same path climbed by countless faithfuls over the centuries and apparently the only way to get on top. We pulled hard on our legs until we finally reached the church of Maryam Korkor; the scenery was astonishing. A priest took us to a small complex of nooks and caves where he was living with other monks. They offered some food and tella and we spent a good 30 minutes to chat with them. He didn’t speak of the hardship of life, but he couldn’t hide it. We realized that these men couldn’t escape into open solitude without a strong faith, without something to believe in. We paid a visit to Maryam Korkor and then walked to the nearby Daniel Korkor, a very small church fell in disuse sitting above a precipice, with great views over the valley below. As with other monastic complexes in the region, women were not admitted in the room holding the Tabot, a replica of the Ark of the Covenant hidden behind a thick layer of curtains and only visible to the clergy. We enjoyed so much walking around that we didn’t realize it was getting dark. After a few more photographs right before sunset, we rushed down the mountain, and luckily we were caught by the night just a few hundreds meter before the car. 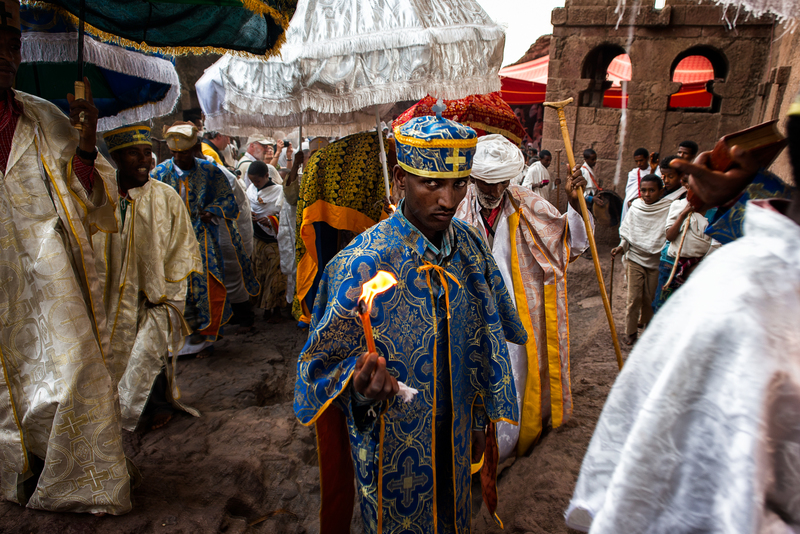 One of the highlights in my plan was the church of Abuna Gebre Mikael. After crossing fields of euphorbia and acacia trees we failed once to locate the priest with the key, but we could finally find him in the village at the base of the escarpment on a second attempt, thanks to the help of kids leaving around. Father Rufael guided us through the “men’s route”, a steep ascent requiring some clambering and a good head for the heights; his sure-footedness was astounding. Father Rufael was attended elsewhere for a wedding and he didn’t make it easy for us, but to our shame we had to stop a couple of times to catch breath before getting on top. The church is a little jewel, one of the few I have seen with no signs of the modern world. The light filtering from the only door and the little windows gives a very special mood to the ornate interior. Before setting out for the descent, Father Rufael told us about his life. 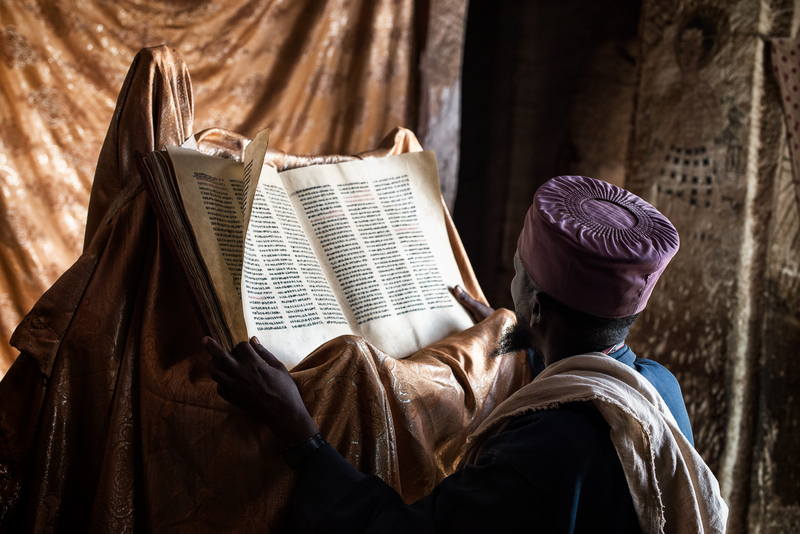 He had been appointed as the new priest of Gebre Mikael the month before, to relieve the previous, old priest from the burden of a daily climb to the peak. There wasn’t much time to talk and we quickly moved on the way back, this time taking the less vertiginous “women’s route”. We ended up close to the house where Father Rufael was attended, right in time to partake in the wedding celebrations. We were welcomed as guests, offered food and tella, asked to take a picture of every person for the amusement of the crowd. 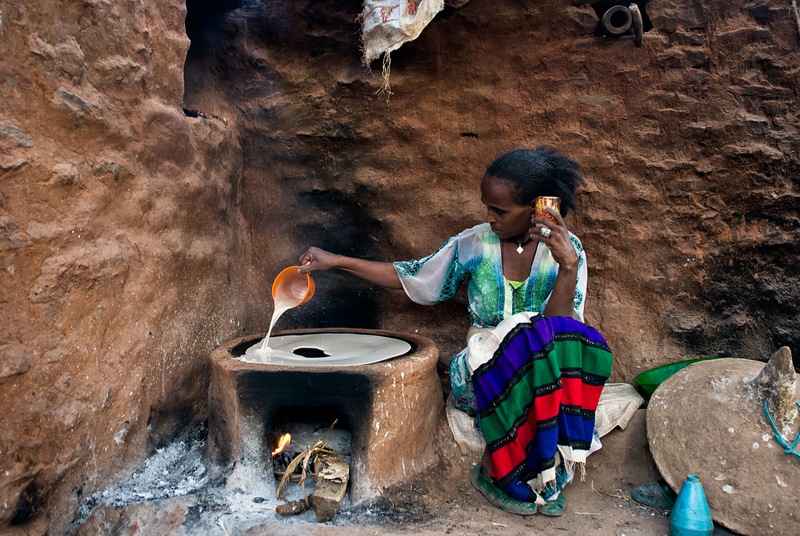 A woman shown me how to prepare injera. Nobody asked money, we were just friends among friends. That was the real Ethiopia.